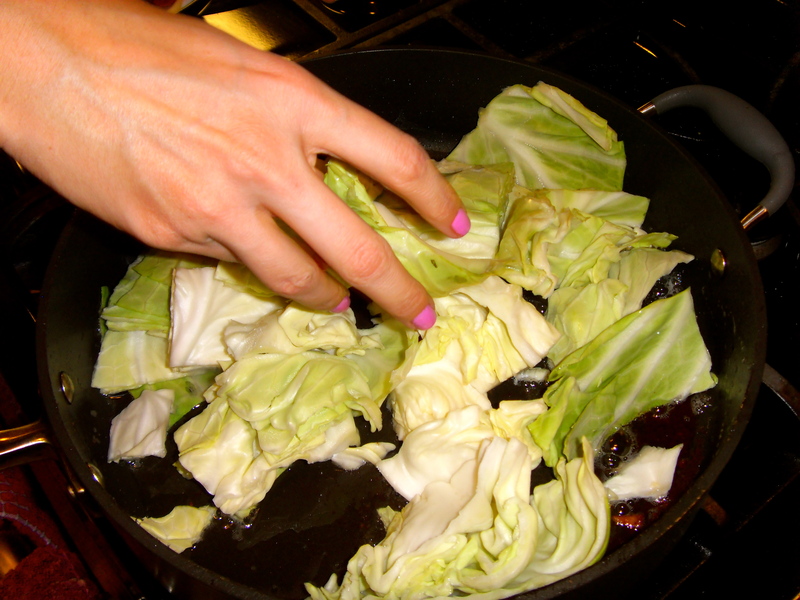 To go with the Oxtails I made tonight I decided to make another favorite of my Grama Glo’s, steamed cabbage. Mmmm mmmm mmm! 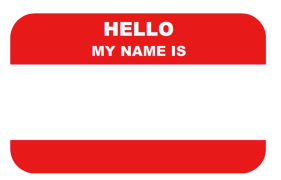 This is probably the easiest thing you’ll ever make. Ever. Quarter and largely chop cabbage and set aside. Using kitchen scissors, cut up the bacon into small pieces, this is the easiest way. Brown the bacon and set aside on a paper towel to drain the grease. You won’t want to use ALL of the bacon fat from a whole pack of bacon, so dump about half of the oil out, keeping the other half in the pan. 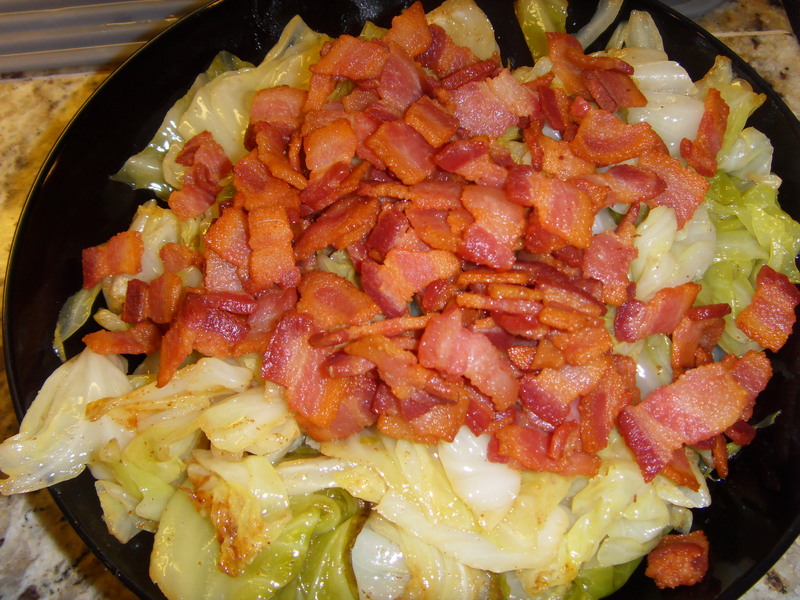 Add all of the cabbage and heat on medium until sizzling. Add 1/2 cup of water, salt and pepper to taste, and cover. Stir every so often but try to keep it covered so it steams down. Cook for about 20-30min. Put in a serving dish and top with cooked bacon! I am a huge meat lover, like I’ve said before. 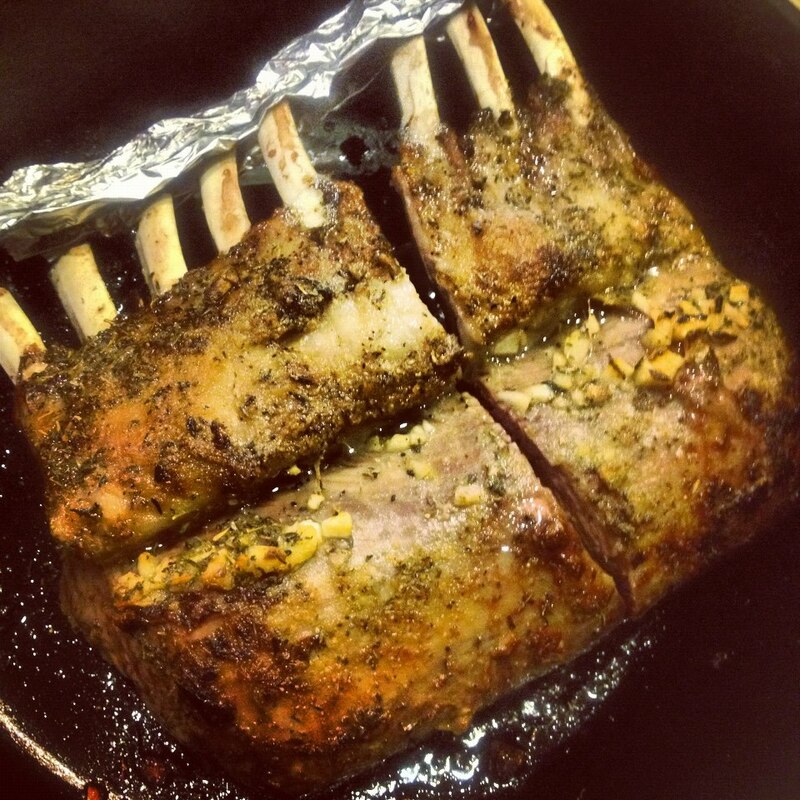 Lamb is something wonderful that not a lot of people make very often. It can be pretty spendy, and Im sure a little intimidating to cook. I promise it doesn’t have to be either! Preheat your oven to 425°. Add the rest of the oil to your cast iron skillet, or whatever oven safe skillet you have, and heat until oil is glassy. 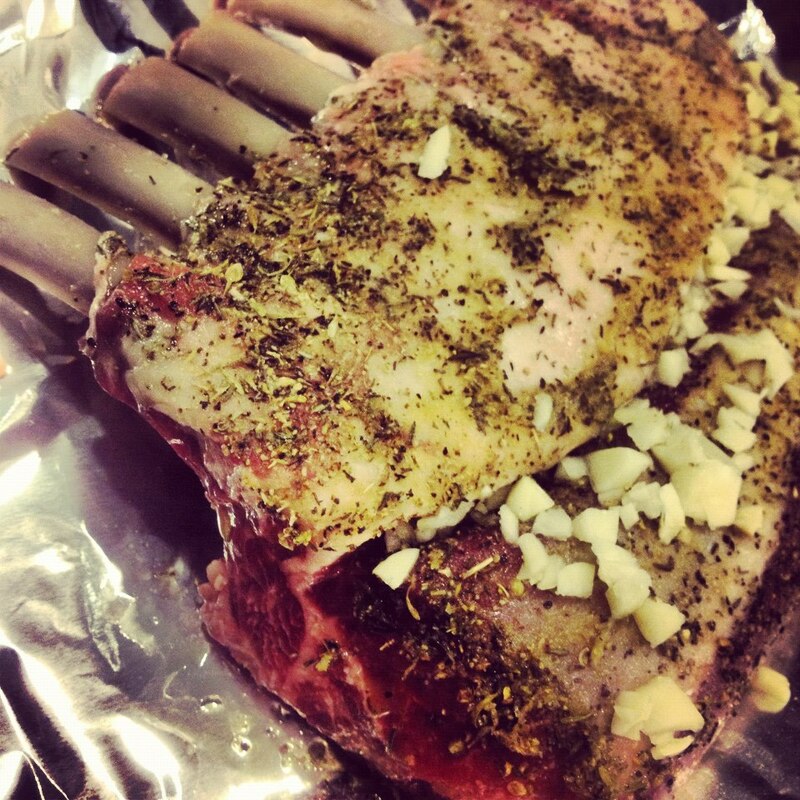 Meanwhile, coat your lamb with a little of the oil, and rub the herbs and salt/pepper into the meat. Sear (brown) meat on all sides, and then remove from heat. 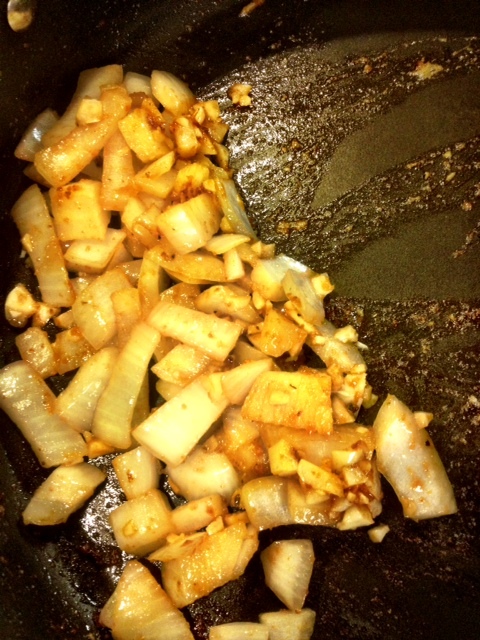 Press minced garlic onto the lamb so that it sticks. Cover the ends of the rack with foil so the bones don’t burn and put your whole skillet in the oven, uncovered with the meat side up, for a short 17min. This will cook a perfect medium lamb, you can cook a little longer for more well-done meat. Serve with rice and veggies, potatoes, pasta… the possibilities are endless! Enjoy! Sunday is not technically considered a weekday is it? Whether it is or not, I like to count it since it as one because it is one of our days “alone” for dinner. Tonight I realized we had nothing in the refrigerator because we have been eating Adobo and Lamb leftovers from our non-traditional thanksgiving feast. I am always interested in what my step-daughter would like for dinner, since I’d like to make something she would enjoy eating. Tonight she requested a Flatbread of some sorts. 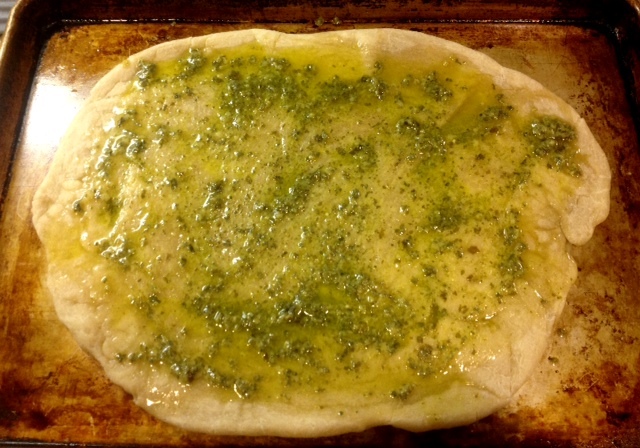 Seeing as though I’d never made a flatbread before, I figured it would be a great first recipe to feature here! Lets keep it really real for a minute, I’m not some stay at home mom with a million hours in the day and a bank-load full of cash to spend on fancy ingredients. We budget ourselves around here, but that doesn’t mean we can’t have delicious food for a reasonable price. I went to the grocery store this evening and spent under $100 ($92.60 to be exact, after my club card) on groceries for 4 substantial meals that will definitely be wonderful for leftovers. When the 3 of us go out to dinner on a regular night, its well over $120, for ONE meal. Tonight I started with making the flat-bread dough. Mix yeast and warm water in a bowl, or I use a pyrex measuring cup, and let stand for 15min. You will notice a foam start to grow, thats completely normal and what should be happening! This means the yeast is growing and doing its job. I don’t own a large mixing bowl with a hook attachment, so I do all of the kneading by hand like my father taught me. In a large mixing bowl, add flour, salt and yeast mixture. Make sure to add the yeast slowly and gradually, mixing together with one had as you go along. Mix and knead until the dough is squishy, elastic, and somewhat firm. Drizzle a little oil over the dough and use your hands to coat the entire blob, place it back in the bowl and cover with saran wrap to let it “rise”. 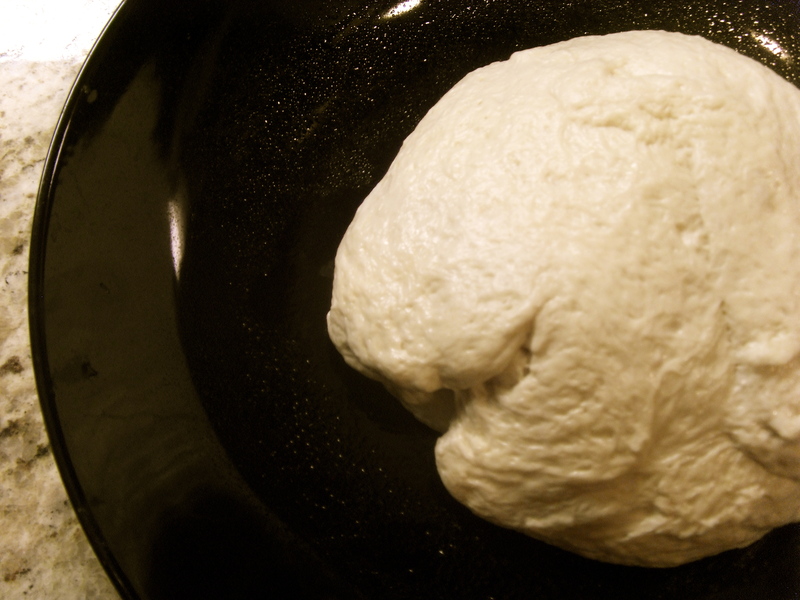 When the dough is finished rising, it will have grown in size about two times. While the dough is rising, you can prepare your toppings. ALWAYS always always season your food, people. Please. This isn’t hometown buffet for 90yr olds. We want flavor! I used a little salt, pepper, onion and garlic powder to season my chicken breasts, you may use whatever seasoning you like. Browned the chicken in a skillet and set aside to cool. 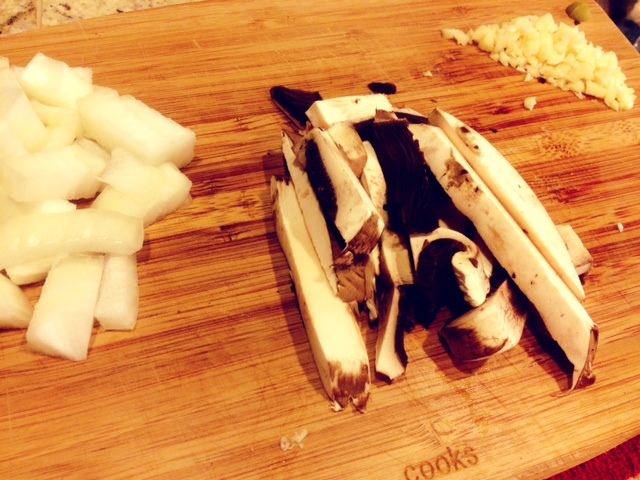 Roughly chopped the onion, diced the garlic, and sliced the mushrooms. I then added a small drizzle of EVOO (extra virgin olive oil) to the pan I had just cooked the chicken in. Don’t get rid of that yummy flavor by starting over in a new pan! Add the onion first and let it sweat, then add the garlic and mushrooms and let it all swim together and absorb the juices and leftover seasoning from the chicken. You can use a wooden spatula/spoon to scrape the bottom of the pan and loosen the little bits that are stuck, thats ALL flavor! Cut up your cooled chicken into small, bite-size pieces. Your dough should be nice and ready by now so pray some PAM, or whatever cooking spray you have, on your preferred baking sheet and, gently, begin to roll or stretch your dough out to the size you’d like it to be at. After the dough is rolled to your desired thickness, put it in the oven to “set” (about 5min). Covered just enough so that your dough doesnt dry out. And then begin to add your toppings! I added the onion, garlic, mushroom mixture first and scattered the chicken on top of that. As soon as the oven is ready to go, sprinkle with all of our parmesan cheese and bake for 20-25min! If you’re into crispier crust, roll your dough as thin as you can and cook it until the edges are to the doneness you prefer. This is how our Flatbread turned out. 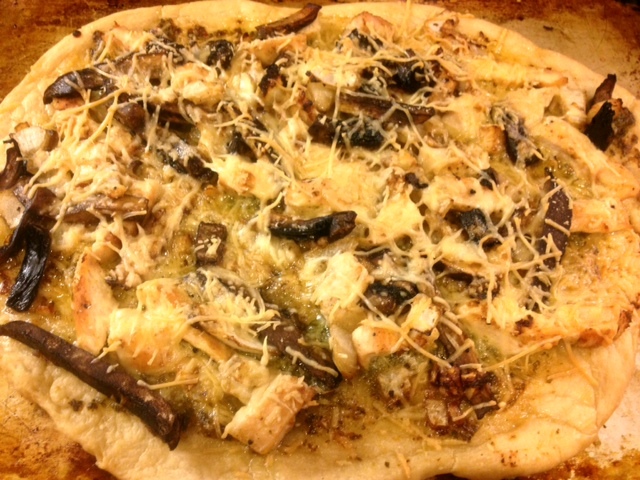 Nice and melty cheese, crisp edges, moist chicken and mushrooms… I will definitely be doing this again! Next time I’ll experiment with different ingredients. I feel like sliced brussels sprouts, pancetta or prosciutto, and bleu cheese crumbles would be amazing. Where does one really start with something like this?? I guess I could tell you a little about myself and why I decided to make this blog! My name is Stephanie and I am a sunny Southern California resident. I am an avid cook that once had the dreams of going to culinary school, my father is a chef and taught me a lot growing up. That was curbed when I realized I would take all of the fun out of my passion for cooking by going to school for it. So now I do it during the week while hubs is away, and sometimes the kid helps me, which is awesome! In this blog I will mostly be making food that is new to me. Things that I have always been afraid to try, in fear of failure. <– BIGGEST fear in the world btw. Some of the dishes will be my old favorites, and some will be picks by the kid. I really hope people like what I have to share 🙂 You may even meet our alien kittens at some point.